This is one of the VERY few leftovers that Kid will eat the next day for lunch. The prizewinning factors are the crispy rice noodles that go with it. If you have not tried the canned version (I grew up on the kind in the bag), they will change your life! Ok, probably not, but they are a lot fresher-tasting and crunchier. And, unlike the bagged kind, these don’t seem to last long enough to get stale. I microwaved a pouch of Uncle Ben’s Ready Rice – brown rice. Meanwhile, I diced and heated up some leftover chicken (about a cup?) along with a couple of handfuls of organic frozen veggies that he likes (corn, carrots & peas) in a skillet, along with some fried rice seasoning and soy sauce to taste. You can add chicken broth by the spoonful if you need more moisture to get the seasonings mixed in well, but for me, the water released from the frozen veggies was enough. Plus, I probably added more soy sauce than you need because we like things salty. Finally, I emptied the rice into the skillet and tossed it well so everything got the good flavors. That was the dinner the night before. (There’s just the two of us most nights, so there’s just enough leftovers for his lunch. If you’re family’s bigger, you’ll have to increase the quantities accordingly.) One thing I do love about this dish is that the fried rice seasoning and soy sauce disguise the taste and color of brown rice. It’s honestly about the only way Kid will eat brown rice. 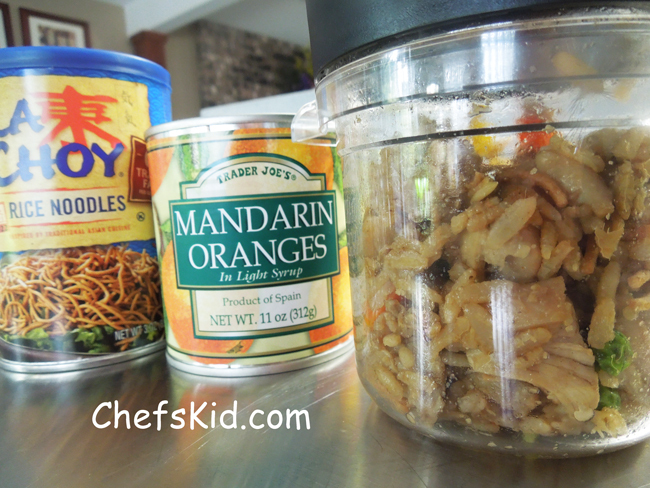 I serve it with crispy rice noodles (mentioned above) and Mandarin oranges because he loves them. If fresh organic clementines / cuties / tangerines / or other small oranges are not in season, I use canned. But I get my canned oranges from Trader Joe’s because theirs are a product of Spain, and the cans are bigger. To pack it for lunch, I have a microwavable food jar from Thermos that holds the heat well. If I heat it up for about a minute before packing it, it will be ready-to-eat-warm (warmer than room temperature, but not at all hot) by the time he sits down to lunch 4 hours later.